Another one I should have posted ages ago! This was a COOP and CABOODLE party we did for a couple of gorgeous little girls (twins!) in February. 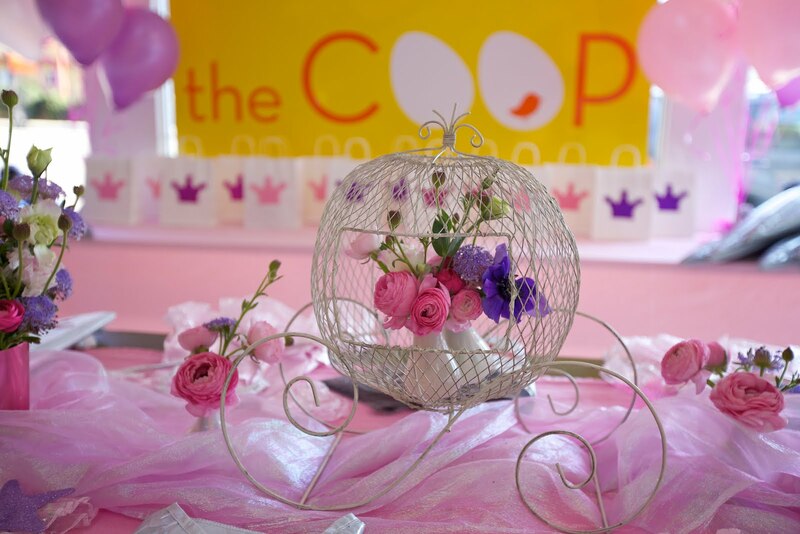 It looked so wonderful -- and the girls LOVED it! Pink, Red, hearts, candies, cookies, fresh flowers -- it had all the makings for a fabulous celebration! 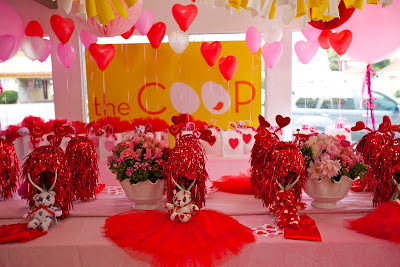 With the WHOLE COOP and CABOODLE package we include flowers -- so I did 2 very large -- super gorgeous pink and red arrangements and used them as the main focus for the main table in the lobby. We had heart shaped balloons on the goody bags, high chairs for the guests of honor festooned with feathers, matching heart shaped birthday cakes for the girls.... and Giant birthday Balloons inside and out adding to the festive feel! I used my hand dip dyed pink ombre table cloths -- which I adore, inside and out. Super fun and festive. 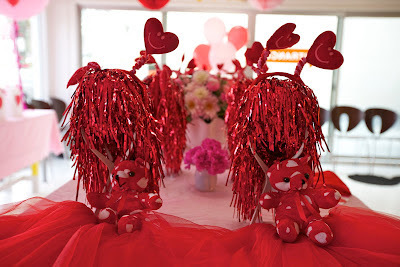 The kids all got Little teddy bears with hears on them, red mylar wigs, and heart shaped head boppers (very cute on!) 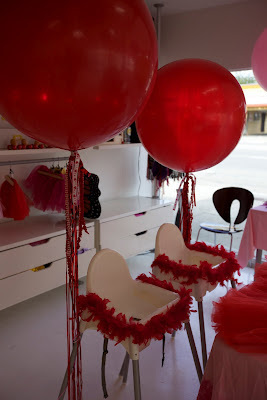 -- and tutus for the girls and red capes for the boys. It really was a spectacular party... and mom was thrilled with how it all came together. My goodness... this party was soooo long ago! And soooo fabulous! I can't believe I haven't posted it yet. It was actually the inspiration for Ashlee Simpson's Bronx Zoo Party -- I had done this shortly before I met with her and thought it would be a great theme for her -- if we just boy-ed it up -- and made it more traditional safari / zoo-ish! This one was NOT very traditional. This one was for my sweet little Grace... my friend Jen's little girl. She's the one who had the Dolphin, Donut, Disco party last year. 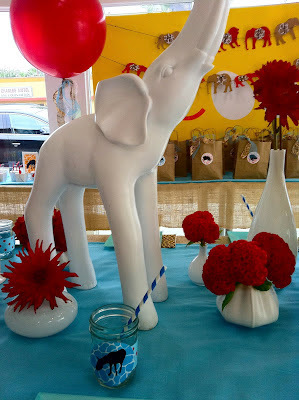 Grace has lots of ideas and opinions -- and I just LOVE taking her ideas and turning them into a gorgeous party! When I talked to her -- she told me that her favorite colors were blue and red and she wanted them to be the colors of her party. Her mom was pretty horrified by this color combo (I think most people immediately think Spiderman when they hear those two colors together) but I wanted to give her JUST what she wanted. 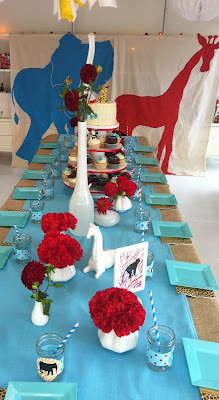 I ADORE Turquoise and red together -- I think its such a fresh color combo -- so we used that as our palette for the party. I wanted to make it non traditional -- partly because of the fab color combo --- so I went with that idea and went for a very MOD Jungle Safari look. Turquoise, Red and White... stark white super modern vases filled with bright red blooms and bright white ceramic animal sculptures on the table (Oh how I miss that lucky Elephant... he lived on my mantle until my hubby whacked him with the Christmas tree and he shattered into a million pieces!) 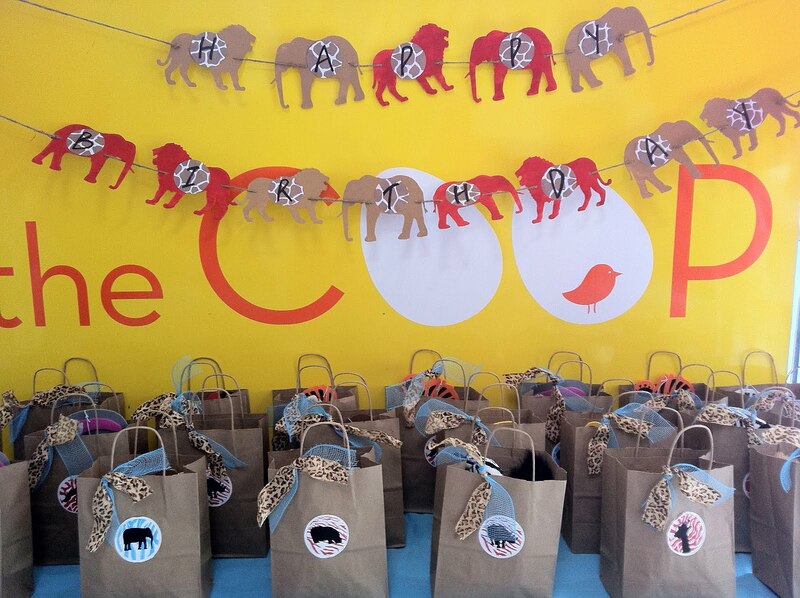 I spent at least 2 weeks painting the giant Elephant, Giraffe and Lion banners... but they were worth it. I think they turned out amazing. 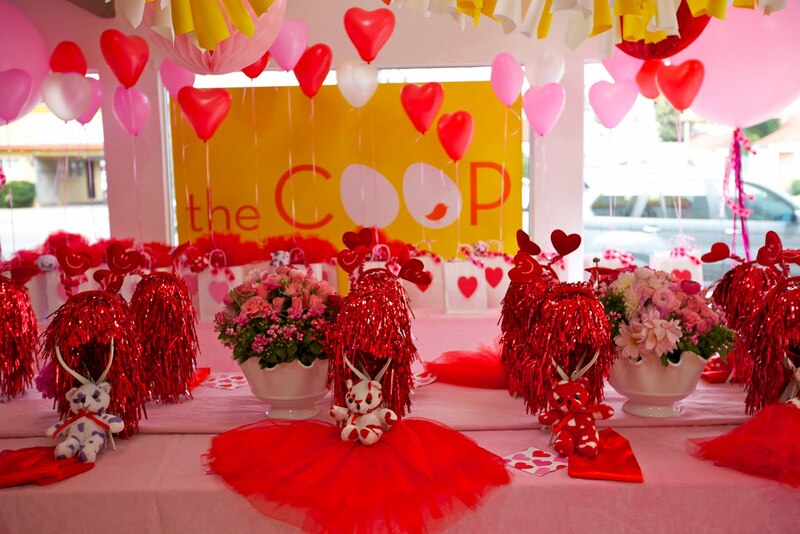 And we have used them over and over at the COOP -- which always makes the hard work worthwhile! 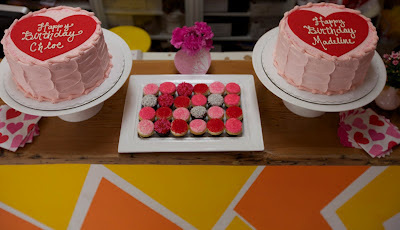 They made such an impact in the space -- and I think the colors are so fun! 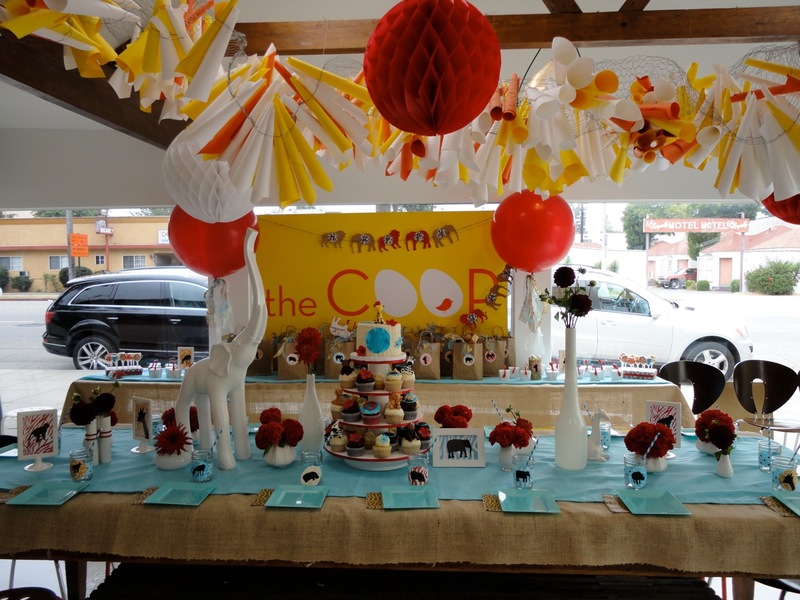 Giant Balloons are Lucinda and my favorite modern party decoration -- so we used red ones for this party. The original idea was to have the wooden monkey cut outs hold the balloons -- but that did't work out... so we just had them monkey-ing around in the bamboo plants outside! 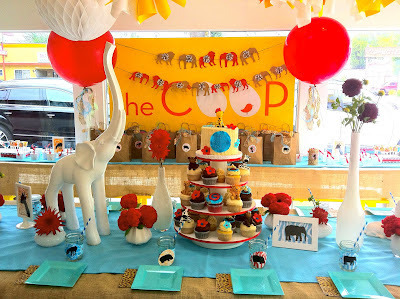 I also had silhouettes of animals framed in white and also on the jelly jar cups on the main table -- where Julie from Blue Cupcake did another one of her amazing cake/ cupcake towers www.blucupcake.com All the kids got to take home animal ear and tail sets, an animal puppet and stuffed animal in their goody bag. 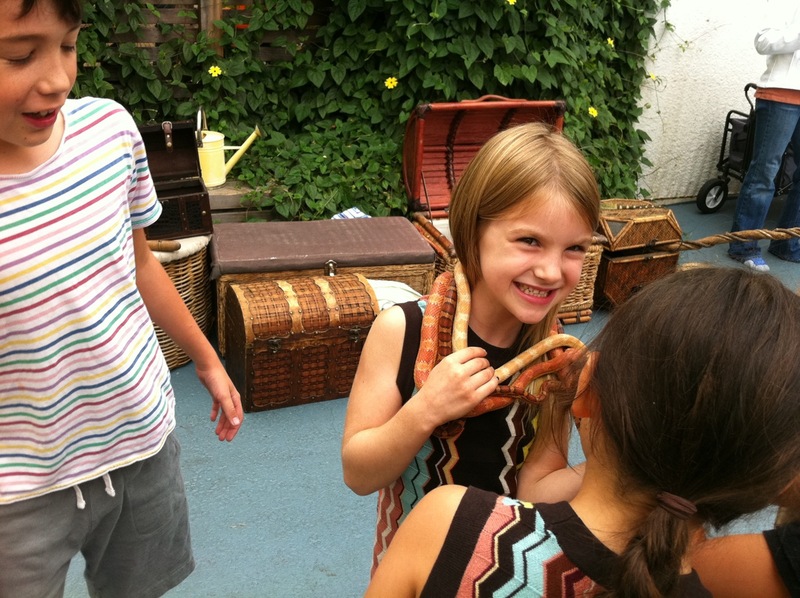 AND -- there was a real live animal show outside the front lobby. 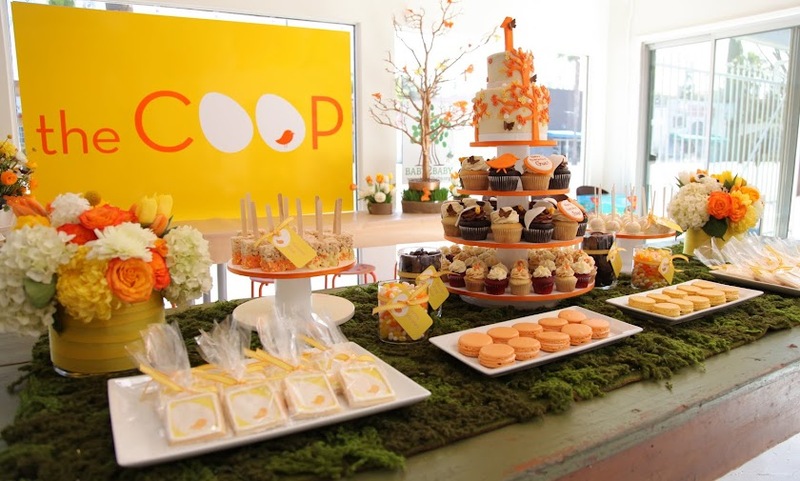 This was a spectacular party -- for a pretty spectacular little lady! Hope you are inspired by the pics! 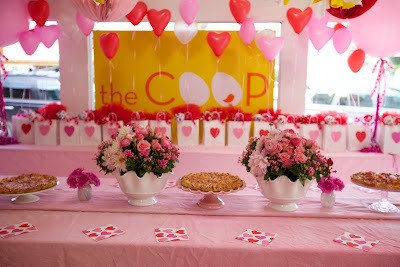 Sometimes it's the moms of boys who are the most appreciative of what we do here at the COOP. I think moms of girls are around fabulousness all the time... so sometimes they are not as shocked by a gorgeous party... but us "boy moms" that are stuck with GI Joe, and spiderman, and sports parties -- seem much more impressed when we are able to take a "boy" theme and make it look great! 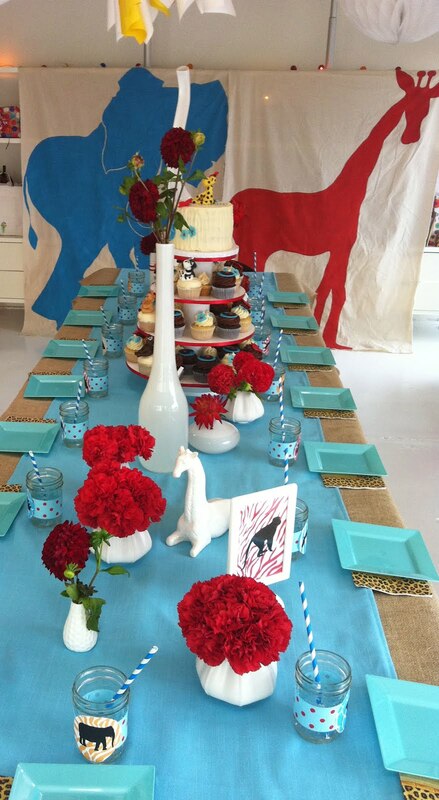 I can say all this because I am a mom of boys and have struggled with the "how do I make a football party look chic?" question myself! 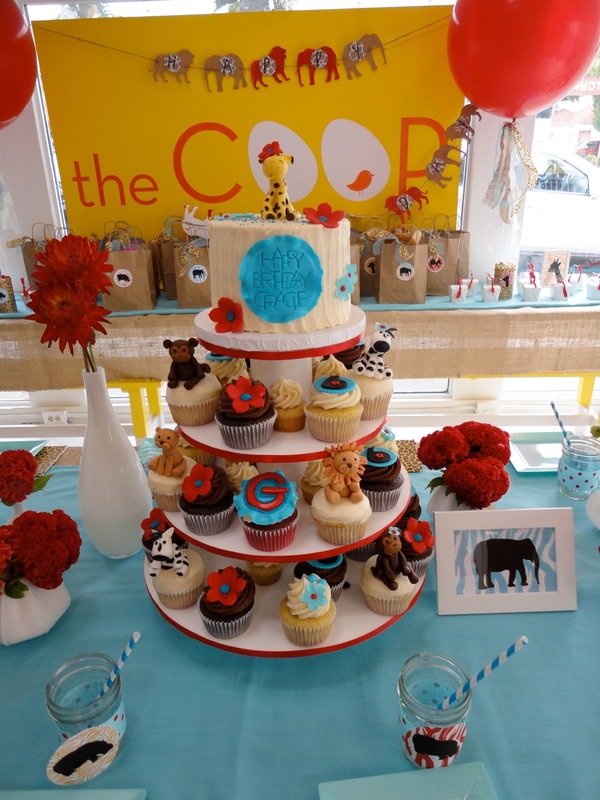 This party mom absolutely fell into the category of super impressed "boy mom". She was THRILLED with the party. She was so sweet -- could NOT STOP gushing about how fabulous it was and couldn't believe all she did was tell us "he wants a Ninja party"... and we were able to come up with this. 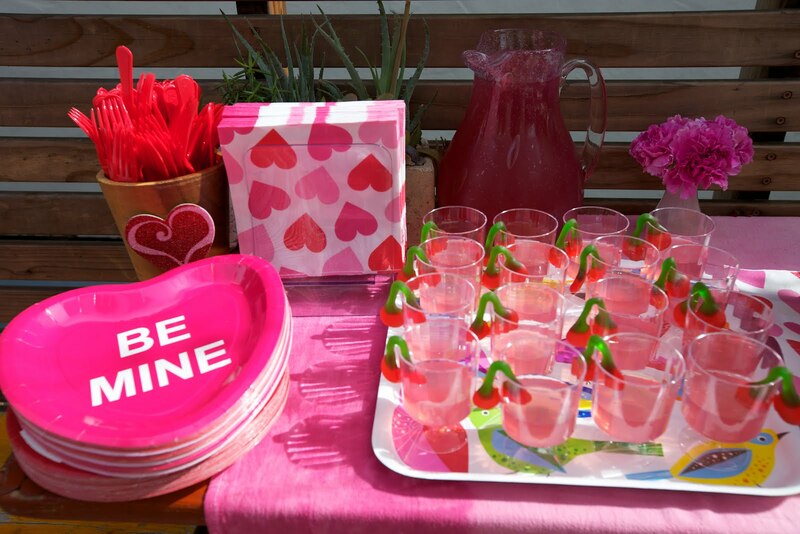 We even added some flowers to make it special -- but not girlie at all!!!! 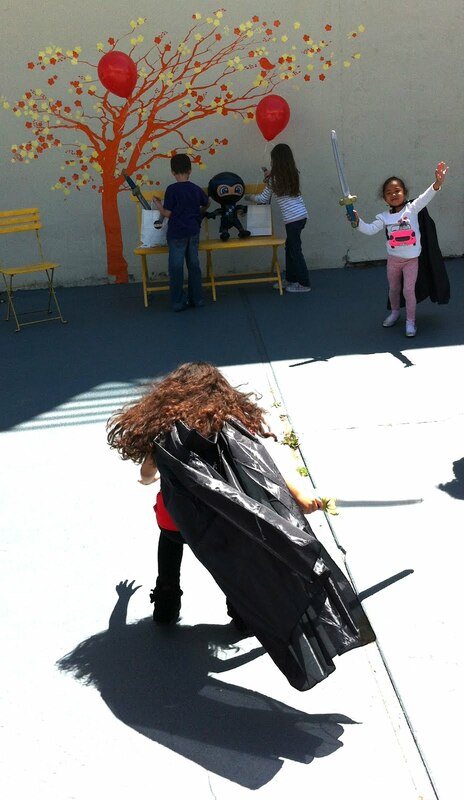 This is the second Ninja party we have done -- and I think they look great. 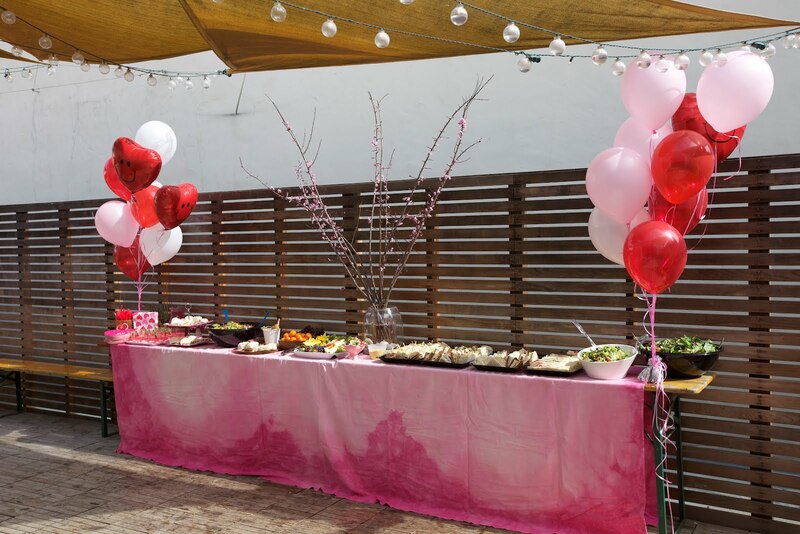 The last one wanted green accents so we did green runners -- but this one I stuck with traditional silver, black and red Ninja colors for the tables and decor -- and hung giant stars above the table (a la Ninja throwing stars!) 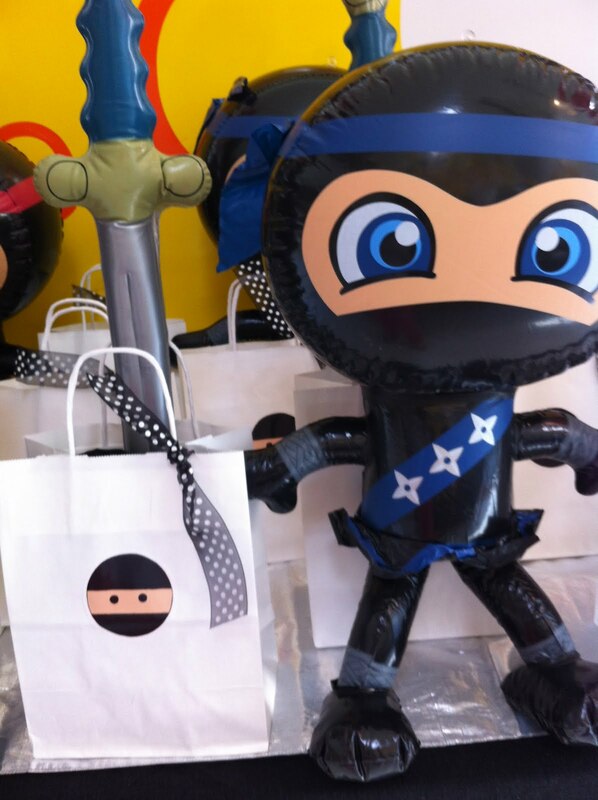 All the boys and girls got inflatable Ninjas (we also used a couple of them as a centerpiece), a hooded black cape (super Ninja-ie!) and an inflatable ninja sword. Sometimes people are worried that girls won't be excited for a "boy" gift.... but believe me -- they LOVED it! Boys and girls alike love an opportunity to dress up and pretend to be someone else! Especially someone as super cool as a ninja! 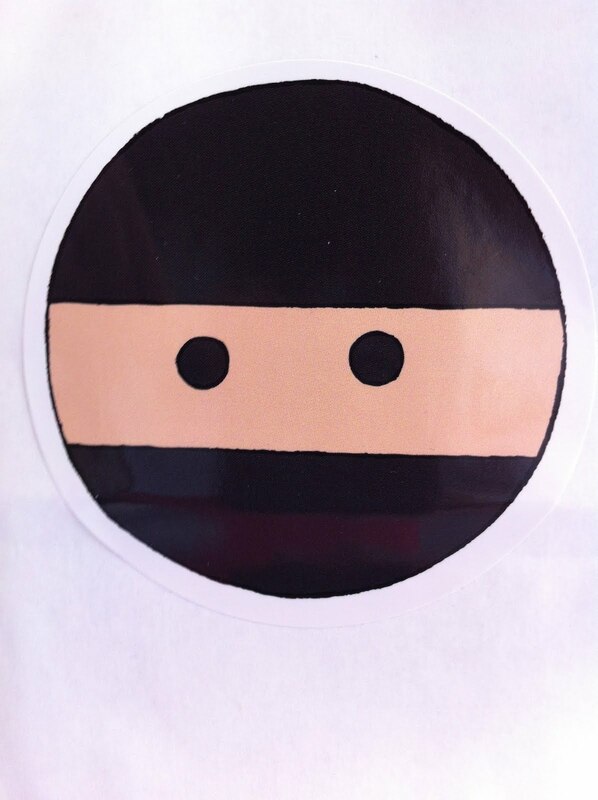 I also love love love the stickers we used for the goody bags. They are a simple modern interpretation on a ninja... just like the COOP is a cool modern interpretation of a playspace! We have done quite a few Princess parties lately -- so I thought I would post some images for you guys to check out. We love a Princess party here at the COOP. As moms of boys only -- we revel in the opportunity to PINK it UP!!! 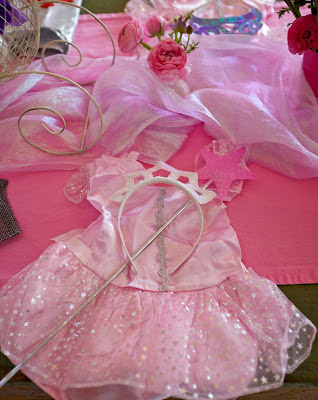 We do two types of Princess parties, really -- a tutu princess party... which I will post pics of as well... or this one which is the Princess DRESS party. 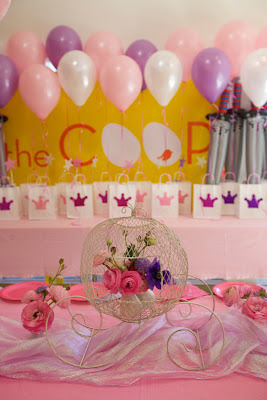 The decor is the same really... Princess carriage as centerpiece, pink (or sometime people opt for purple) table runners and balloons. The girls for this party all go Princess Dresses (which are really just darling on! ), a tiara, and a sparkle princess wand. The Knights in shining armor (the boys) all got to take home a knight costume and inflatable sword. 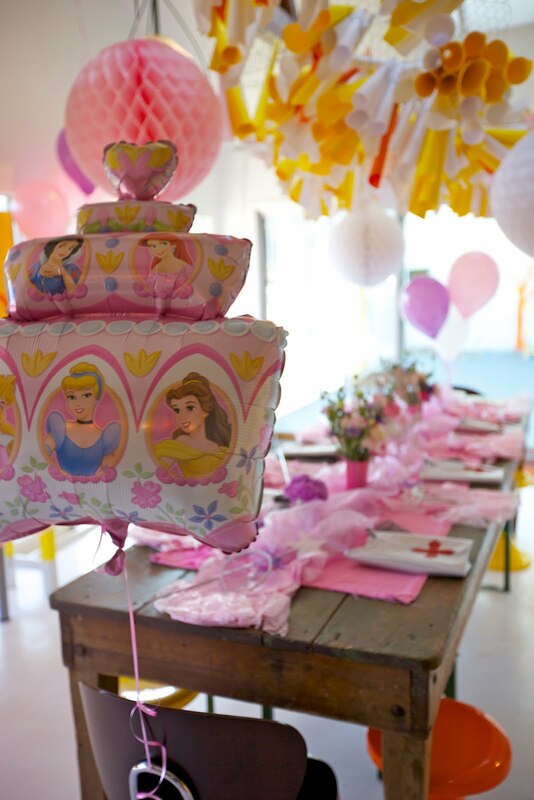 The party is so gorgeous and girlie -- but it's a great party because the boys really LOVE their gift as well (who doesn't want an inflatable sword!) As usual -- we added some fresh flowers on the table (we really find it hard to resist ... even when people don't choose them when deciding on "extras" to add to the party.